In the recent years, several attempts have been made to generate creative compositions automatically. Composing musical pieces, creating visual arts, generating poetic texts are only some of the ingenious objects that computers can generate through machine learning. With the help of programs and computers, you can now create poems even if you don’t know all the rules for poem composition. Natural language generation is a promising subfield of computational linguistics and artificial intelligence. Its primary objective is to develop software and computer programs that can generate human-readable texts. There are different types of compositions that can be automatically generated like jokes, story narratives, weather forecasts, songs, and poems. Automatic poem generation was a hot topic in the 90s. During these years, this concept was first theorized. It was avidly discussed and debated in scientific meetings and then published in magazines and literature. On the ALAMO group, various French poem generation programs can be utilized. Their Gervais and Rimbaudelaires Rubaud J and P are two of the French poem generators that exist on their website. They mainly use existing Rimbaud sonnets as a template and then their program replaces the adjectives, verbs, and nouns by words that appear in Baudelaire’s poems. In 1999, Hisar Maruli Manurung, a doctor of philosophy, introduced a chart system that generates syntactically correct texts, which follow a rhythmic pattern. By reversing a chart parser, utilized for parsing, Marunung came up with a chart generator that translates abstract forms to strings. The strings are then used to produce natural language strings that match certain stress patterns. The first-order logic, which represents sentences, illustrated the inputted semantics. While generating the final output, the result’s stress pattern, which is based on a new rule, is checked, and analyzed against the pre-defined stress pattern before adding the rule to the Manurung’s chart. The stress patterns are described as a list of strong and weak syllables that are obtained from a certain dictionary. The Manurung’s chart system maintains a rhythmic, syntactic, and semantic quality at every step while sacrificing flexibility and frugality. As a result, the system sometimes produces a zero output. The WASP is a rule rule-based system, which means that it is based on a set of if-then statements. It is considered as the first attempt at automatic poem generation. WASP is a kind of system that provides intelligent answers to given problems. It is comprised of multiple programs. These programs implement various construction heuristics from formal metric constraints that aim to create a poem based on existing poetic text in the system or on the internet. Tra-la-lyrics is a system that produces Portuguese lyrics. Its output is based on the rhythm of the song inputted by the user. Using the pattern of weak and strong melody beats, this system’s way of generating song lyrics is almost the same to the process of poem generation. In tra-la-la lyrics, the best sentence, clause, or phrase that fits the required rhythm is chosen. While the first strategy doesn’t consider grammar rules, the second and third strategy doesn’t ensure the presence of rhyme. The quality, length, properties, and elements comprising the final output of poem generators are often varied. But, with generateapoem.com, you can always get the creative poem that you wish to have. This website provides users an innovative poetry generator that utilizes machine learning to retrieve, translate, and generate a rhythmic poem that is based on the specified format of the user. It applies unsupervised learning to describe word stress syllable patterns and to analyze discourse models. The website also allows you to choose the type of poem that will be generated. You can either choose from couplet, haiku, sonnet, and complex. By specifying some rules, you can easily have a poem that conforms to the standards that you’ve set. Th ere are plenty of students, full or part-timers, who are finding it quite difficult to satisfy their class requirements. It may be because of a lack of time or simply just having too much on their plates at once. Recognized not only by reputable tech and service entities, but highly-renowned channels such as Forbes, School Solver is the best marketplace for homework assistance. Register for an account and start asking questions. It is that easy. When you enter a question into the search bar, you will then be prompted to a page where you can upload your homework requirements. Provide all of the necessary details and set your budget (this is unique to School Solver because other sites have predetermined rates for homework completion services). Set a due date and choose a topic field from a wide array of subject matters from Art to Urban Planning and Policy. Wait for a response and receive your completed and CopyScape-checked homework before it is due. Boost My Grades offers homework completion services for those who are engaged in online education. Aside from working on homework assignments and projects, the company can also attend your online classes on your behalf. You simply have to register, follow the on-screen prompts and identify the services that you require, and then settle all fees by paying with your credit card. Boost My Grades does not only work on the assignments you submit but also tracks their progress 24/7. Live chat tutors are available and their consultants are all expert students. Pay Me To Do Your Homework offers something that its competitors don’t. The service provider promises that you will get either an A or B in your homework assignment or else you don’t have to pay for a thing. This just shows you how confident they are in the service that they provide. The service specializes in college-level homework and offers free quotations online prior to any service availment. They can work on anything from simple assignments to exams or complex projects – whatever you need really. They have been around since 2010, is established as an LLC in the Big Apple, and have been featured in multiple news outlets. With My Homework Done, you can expect your homework assignments to be completed overnight. This is extremely reliable if you are working with very strict deadlines or just happen to have that one assignment you simply have no time to process on your own. Unlike other service providers, some of the unique selling points of My Homework Done include free revisions and 24/7 customer support. Revisions cannot be absent from the equation, especially with writing assignments. Not having to pay extra for revised work is really advantageous for students working with limited budgets. Having an available support team when you need it the most is another highly-beneficial provision. The platform of All Homework is fairly simple. Just upload any type of homework into their system and they will find experts who can work on these. Fees are based not only on the complexity of the assignment but the deadline as well. All payments can be done online through a secure payment platform. All homework solutions can be downloaded from the site via a link that they will be providing you through email. They also go the extra mile by providing explanations to homework answers (especially those which fall under Mathematics or Science) – one of the services that they uniquely offer. A PDF (Portable Document Format) file is opened with a PDF viewer. It allows the presentation of documents in a more interactive way. In a fixed layout, it usually contains a unique description of graphics, fonts, and texts. If your PDF viewer won’t open, a common reaction is to think that the PDF file is corrupted. Perhaps, the practical solution is the retrieval of another copy. But, this is not always the case. There are instances when corrupting a PDF file can be done on purpose. With the trend today, learning how to corrupt a PDF file is handy. Others resort to it as a canny (and less obvious) way of asking for an extension. It can be advantageous for school and work. To know how to corrupt a PDF file, simply follow a few instructions. Step # 2: Select a PDF file that you want to be corrupted. You can choose a PDF file anywhere on your computer or other uploadable sources. Step # 3: Begin the PDF file corruption. Click CORRUPT FILE. Step # 4: You will receive a confirmation message of your PDF file’s successful corruption. Usually, it just takes a few seconds. Your corrupted PDF file is then available for download. You can scan the provided QR code to permit download of the corrupted PDF file to phones. 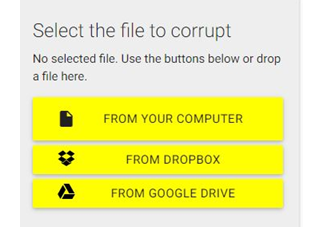 In addition, you can download the corrupted PDF file to your Dropbox account or your Google Drive. When Pay Me To Do Your Homework was first introduced in 2010, students thought they found a savior for their difficult papers and excruciating assignments. The business was established in New York and claims to have American employees as their “experts.” Founded by Jessica Mott, the company has done countless homework for countless students, on the belief that their employees can score better in exams compared to the average student. Thus, to score well in academics, you need help from this company. However, this Pay Me To Do Your Homework review is here to refute such claims. True, this company delivers, and they do on time. There has been no instance when they delivered a homework way beyond the deadline. The writer worked fast, and the customer service responds promptly. Read more of this Pay Me To Do Your Homework review and see what the company really does. On the other hand, there are more banes than boons with Pay Me To Do Your Homework. I have tried their service and was not at all satisfied. I wasn’t able to return my work because of time constraints, and had to make do with whatever my brother could edit. For one, Pay Me To Do Your Homework “experts” seem to write hastily that they do not check facts and grammar. I had the misfortune of getting such service; the homework was done pretty much how I wanted some details and requirements to appear, but there are tricky pieces of information that needed full research. Sadly, a point or two in the said homework lacked a thesis statement and the data needed to back them. I had to do quick research myself. When the homework was sent as a file, the word processor found several spelling errors in the document. Spelling is a basic feature in such writing companies, and should not be a problem if the company has real experts doing the job. That said, the word processor took care of the problem and I was able to submit the homework. Just a quick thought: When you don’t receive what you expect, you have to get back your money, right? Pay Me To Do Your Homework says they have a money-back guarantee. This feature, it seems, is relative. They didn’t return my money despite such service, and I didn’t bother persisting. But shouldn’t it be the right of the customer to get back what he paid for after getting crappy work? While it was not entirely a bad write-up, I believed in what the company promised and I expected that they would exceed expectations. If you need to have the perfect homework, find other writing companies. Spare yourself the trouble and skip Pay Me To Do Your Homework. This is not to malign all writers of the company, but if you are unfortunate enough to entrust your assignment to just any writer there, then you may just have had the same experience as mine. It would also do well for you to do some fact-checking yourself, just to be sure. Don’t be too complacent about the homework, even if it looks polished. There could be devils hidden there that could jeopardize your grade. It is good if you read this Pay Me To Do Your Homework review. I hope it helps you choose better writing companies. Chegg is an internet-powered company that provides assistance to students such as textbook rental, tutoring, homework assistance, test preparations, and scholarship and internship assessment using the power of the web. The website, www.chegg.com, gives students 24/7 access to thousands of books and literature that they might need for their studies wherever they are. Users may also get answers to their questions as well as clarify solutions to their homeworks by asking a pool of tutors that cater to a wide range of subjects and fields. Although relatively cheaper and more affordable compared to renting textbooks in bookstores or hiring a personal tutor, Chegg requires users to sign up for a monthly trial that costs $14.99 in order to access the website’s features. This should not be a problem if the website will be used on a regular basis. However, there are some students who only need assistance with one or two questions in their homework. Thus, paying a somewhat-huge amount for just a couple of questions doesn’t sound like a good deal. And while many blogs claim to teach readers how to get free Chegg answers, their solutions often don’t work. A simple trick on how to get free Chegg answers is by using other sites that offer similar services. One good example is School Solver at www.schoolsolver.com. A lot of tutors listed on this website are registered Chegg users, too. Simply ask a question but do not forget to mention that the question can also be found on Chegg. That way, an interested tutor with an active Chegg subscription can simply log on to Chegg, find the answer to the question, and give it to the user. Think of School Solver as a middleman between Chegg’s pool of information and a student who has no Chegg subscription. In order to ask a question in School Solver, though, the user must set an amount that they will pay to whoever answers the question. Although technically not free, this is a lot cheaper compared to Chegg’s subscription cost, making it ideal for users who only need answers to a few questions. Sometimes, it’s just not easy to work on an assignment alone, especially when details are quite confusing, and you just have no idea what to do. Luckily, there are online homework marketplaces that you can rely on to help you with your assignments. Take a look at two of them below. Neat Interface. It has this really neat and easy to understand interface that won’t make you confused, but rather help you know where to click on, and what’s in store for you in the website. Some of the things you’ll see include: Homepage, Ask Question/Answer Question tabs, what kind of questions you need to ask, and details about how this might affect plagiarism. You’ll also get to see a list of the questions that have been answered recently, and see who the top earners on the site are, as well! 2. You can ask questions, and answer questions, as well. Another amazing thing about the website is the fact that you not only get to ask questions, you get to answer questions, too. This builds a great community between the users of the website, and the moderators, as well! Prices are flexible! And, possibly one of the best things about the website is the fact that prices are flexible. You pay only what you can for what you need—and you can expect quality work at that! 24/7 Online Study Calculator. This basically means that any time you choose to ask a question about your assignment, you’ll also get the answer any time of the day! There are no breaks and holidays—which means it will be easy for you to finish your homework! You can ask questions. There’s a bar in the website where you can type in your question. The problem though is that there are only limited answers on the site. For example, if you try typing “what is nebula”, variations of the question would pop up on screen and you’ll see that they’re not really what you need—which of course could be a hassle, especially when you have a deadline to catch. With that, you may feel like Google would’ve been better to use. Four Major Categories. These are namely Science, Engineering, Math, and Business. So, if you’re majoring in courses related to these, or if your homework is related to the said categories, you can expect to get the answers you need. Otherwise, you might have to check other websites or School Solver to help you out. While both websites have amazing features, it’s safe to say that School Solver is better and leads the pack of homework help websites around. The reason for this is that School Solver has a broad category of questions and answers—it’s not just focused on Business, Math, Engineering, or Science. This way, you know you’ll get to ace your homework and have the best grades, too! Aside from that, it’s also good that you have a chance to interact with the community and that you get to help one another. This way, you know that the answers don’t just come from robots—which means the answers are real and are useful. And of course, the fact that pricing is flexible helps out a lot, too! After all, money really does not come easy these days and it’s important to get good services without burning a hole in your pocket. Try School Solver and your homework will no longer be a problem! Good Luck! My Awful Experience with AceMyHW.com! I was hesitant to try a different online tutoring site because I was afraid of getting scammed. I got interested to try the process after I have read several reviews about how other students benefitted from this kind of service. I will never forget my first experience in using this kind of service. I was loaded with difficult homework. While I did my best in most of these assignments, I decided to pay an online tutor for the rest. I wanted to get help, save time on finishing my tasks, and ace my exams — even for the subjects that I really find hard. These are the three reasons that made me choose to try out acemyhw.com. On the homepage of AceMyHW, the three most notable lines that you will first notice are: Get help, save time, and ace class. At that time, I badly needed those three, so I immediately signed up without doing a background check first about the feedback of the site’s past clients. This is an important step that you must not skip when trying to choose among the hoards of online tutoring sites. The fact that there are a lot of choices will make you think that this kind of venture must really be good business. Never judge a site based on what it states on its web page. It is safer to trust other people’s feedback, especially those who have tried similar services. After registering, I was ready to ask my questions and let the experts behind AceMyHW handle my homework. I was only on my first question, but I already experienced difficulty in getting it through. I thought that it might be due to my Internet connection or maybe there were certain glitches in my laptop. I logged out and rebooted my PC. Before logging in, I cleared the cookies from my browser and made sure that there were no problems with my Internet speed. I still had the same problems in sending my question when I logged in again at AceMyHW. I began to feel frustrated. What about its promise that I can get help within 10 seconds when I couldn’t get my question through, in the first place? While most people would do the right thing and find better sites at this point, I kept on sending my question until my patience wore off. It finally went through after I had wasted more than 15 minutes that I could have spent in trying to answer my homework on my own. I contacted the site’s support team when I couldn’t get my question in, but I received no response. No one bothered to check on my problem until I had fixed it on my own by merely waiting and endless clicks of the refresh button. Just when I thought that I had a bad experience in using AceMyHW, I wasn’t prepared that the worst was yet to come. Most of its tutors do not speak fluent English. I had a hard time understanding them. How could I ace my class if I could speak and write better English than my tutors? Without getting any clear answers, I decided to log out and promised myself never to use the services AceMyHW ever again. Not all of us have the ability to solve every single question/homework asked in school. You may easily answer science questions but might find it hard to write an essay. The people behind School Solver and Homework Market both understand the need of the students for online tutoring. However, even if they both offer quality homework answers, there are still differences in the services they offer. But before we go to the differences, let’s identify their similarities. First is the variety of topics. They offer answers to a wide range of topics from simple questions about math, science, and English to more tedious and complex topics like engineering, accountancy, and finance. Secondly, both are protected by Copyscape – a tool for checking plagiarism. Answer seekers will be guaranteed that their answers are original and not lifted from any source in the internet. Lastly, they both provide a space for asking questions. When you visit either site, you will immediately locate where you can ask your question—no need register before submitting your queries. Now, let’s specify the differences of both sites. One thing I have noticed in Homework Market is that it looks cluttered compared to School Solver. There are charts containing information about top teachers, online users, news feed, top earners, and ads. I would personally prefer a simpler user interface. What I like about schoolsolver.com is the organization of information in their website. Your eyes will be automatically drawn from the top of the page, scanning every detail down to the bottom of the page. It has a clean heading, then you would already see the pages of the site, then the space for asking questions, and other information about them. You can easily browse their site without too much unnecessary information. In Homework Market, the teachers or the answer givers have the power to bid for the answer. This means you cannot negotiate for the price. It all depends to the people who want to answer your question. But in School Solver, upon asking your question, you can already place the amount of money you are willing to pay. This helps you manage your money. You will not be lured to buy answers which are above your desired budget. Also, the user who is willing answer your question will know how much money you have allotted for the assignment. In Homework Market, you can send a message to the assignment solver or the question giver. However, in this site, even though you have a username, you can publicly see who is talking to whom based on the question page at the top. I would rather send someone a private message so that people wouldn’t know whom you are contacting. And since you could see each user’s profile, you can already judge their credibility when it comes to buying answers or providing quality answers. In School Solver, these conversations are kept private. All things considered, I would choose School Solver over Homework Market any day because it is simple, organized, budget-friendly, private, and easy to use. One of the requirements for passing a subject or a course in school is to submit homework. It comes in all forms: book reports, analyses, dissertations, and math problems. However, not all students are equipped with the right skills to write an essay or solve a mathematical equation. While top search engines could generate instant answers, they do not specifically give out lengthy discourse on a subject matter. Worse, they would often contain ideas that do not meet the standards required for the assignment. As a result, many students seek help from online homework marketplaces that provide answers and tutorials for those who are willing to pay a price for the assistance. The success of this service has spawned many websites that cater to the homework needs of the students. Among them are School Solver and Study Acer. Having reviewed them both I think it is important to have a general overview for a quick glance of the similarities and differences. This article will compare the features of School Solver vs Study Acer in order to find out which one has the best stuff to offer. It will also serve as a guide on how each site can be utilized to its full potential. • Find A User – This option helps members to find a particular user — whether he or she is a tutor or a student — so they may see his or her rating (reputation) or to simply connect with him or her for discussing the homework order in details through a private messaging feature. • Instant Messaging – There is a chat box located at the lower right area of the screen. This allows the users to chat with online tutors and assignment solvers. • Money-Back Guarantee – This is a totally nice offer as it makes sure that the submitted work has passed the purchaser’s standards, thus limiting the likelihood of producing irrelevant and poorly written assignments. If you were to compare School Solver vs Study Acer, it is this feature that sets the biggest difference between them. • Categorized Fields – Users are provided with a list of subject codes for easier navigation and location of the answers. Each subject may contain tutorials that are available for purchase by students. • Testimonials – Study Acer takes pride in its growing pool of tutors and this is is evident in its inclusion of testimonials made by users. You can view them on the left side of the homepage screen. • Latest Questions – The site displays the recent queries and homework orders to make it easy for the tutors to find time-sensitive assignments so that they can work on them right away. Comparing School Solver vs Study Acer is the best approach to knowing the pros and cons of the two sites. Regardless of their differences, they both deliver desired results for those who need homework assistance. After recently reviewing studentlance.com, Right now Schoolsolver and Studentlance are the two of my favorite homework/assignment help website that works on the principle of connecting an assignment holder to an assignment solver, supposedly tutors and others. I thought it would be good to do a review comparing the two websites to see which is my favorite as a user. Schoolsolver.com offers an easy user interface with the space for posting a question or query on the very home page of the website. The answer seekers and answer providers are both registered members ad hence, there is no scope of cheating or falling prey to it especially with their refund policy. For both websites, when you post your question or upload your assignment, you will have to mention the amount of money you are willing to pay for getting the answers. The tutors and registered answer givers will post their answers and quote the amount of money they are claiming for that. Multiple answer givers are able to bid their prices and post their answers, which will virtually be invisible, until the student chooses one and pays for it. The studentlance.com website on the other hand is the first thing that will draw your attention. Whether you like it or not, it’s up to you but School Solver has a more minimalist theme that some people seem to like more. Like all other similar websites, here too, you will find the option of posting your requests and getting solutions in two different pages. Simple, as it sounds. But the problem is that the ‘request’ page does not open, no matter how much you try. The amount of money for each service at schoolsolver.com would be determined by the student, depending on what he/she is willing to pay and the answer giver can quote his price. If the quoted price suits the student, it will be bought by the student. As you press on the ‘buy this answer’ option, you will be able to connect to them with your email id, username and password for making the payments via Paypal or Bitcoin. On the other hand, the studentlance.com website claims 25% of the payment that the tutor claims to feature the answer on the schoolsolver.com website. At schoolsolver.com, students will get their own space on the website to have their bought answers stored for future reference. The answer solvers on the other hand will be featured on the website along with the answers they have provided. This will give them the opportunity to get in touch with more answer seekers and get more assignments. However, the categories are limited and not all the subjects are covered to be answered there. The user interface of studentlance.com is complex and you will not find a clear submission of requests and their solutions available. The subject options are huge, but the basic problem is in understanding how to proceed with requesting your query. Registration is free, but there are no FAQs for this website that will help you to understand the process in which it works. The assignment request forms can be availed after you choose the subject. Overall I have to say it is better to choose schoolsolver.com over the Studentlance.com website. It will give you a better and easier result for your questions.